Yahoo! has launched an interesting "Do You Yahoo!" marketing campaign to promote their new yahoo.com homepage and other Yahoo services. If you set Yahoo.com as your homepage this Friday [September 22], Yahoo! will gift [or reward] you a free cup of coffee from Dunkin' Donuts. Now how cool (or hot) is that. 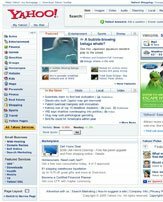 The easiest way to make www.yahoo.com as your start page is to drag this link to the Home icon of your web browser that you see on the address bar. Or you can directly type www.yahoo.com in your Browser preferences dialog. The Yahoo Free Coffee giveaway contest begins at midnight ET on Friday morning, visitors to http://www.yahoo.com will be able to access and print a coupon good for one free 16 oz. cup of Dunkin' Donuts iced coffee. The coupon is valid only on September 22, and may be redeemed from 9 a.m. to 11:59 p.m. local time or close of business at any participating Dunkin' Donuts retail locations in the U.S. while supplies last.